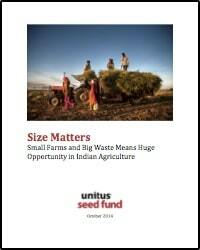 We are pleased to release our newest market report Size Matters: Small Farms and Big Waste Means Huge Opportunity in Indian Agriculture. We believe that Indian Agriculture is a Good Investment! Prior to the Green Revolution, India regularly struggled with famines and could not adequately feed its population. While significant progress has been made in the areas of yield and output, more than half of India’s children under five continue to suffer from malnutrition in a country. Even though agriculture accounts for over half of the country’s jobs, India’s 115M farmers are mostly poor; constrained by small lots, poor infrastructure, and lack of resources. Thankfully, India is also one of of the burgeoning IT capitals of the world, and we are starting to see the reduction of waste via technology which is enabling new levels of efficiency and productivity at scale. This report identifies some of the significant challenges facing Indian agriculture in the next few years. It then highlights some of the innovative trends and the opportunities for entrepreneurs and startups to drive disruptive improvements in India’s agriculture ecosystem.